Nominated for MALE VOCALIST OF THE YEAR by CAMEO CANADA. 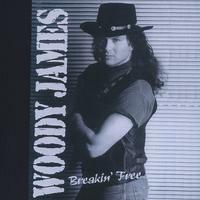 Hard rockin' debut album from Canadian rocker Woody James.This is the album that turned alot of heads. Favorite tracks, Simple Man, Little Miss Queenie. Recent shows include RETROFEST with Edgar Winter and Rick Derringer. This is just wonderful playing and execution.Little Miss Queenie is one of the finest straight ahead rock songs I've ever heard. Vocals are right in the pocket,Killer guitar,as usual! Damn fine pickin', Damn fine !!! Brilliant lead guitar on SIMPLE MAN. That sound is just out of this world beautiful !